Pilates is a great way to get stronger and increase flexibility. 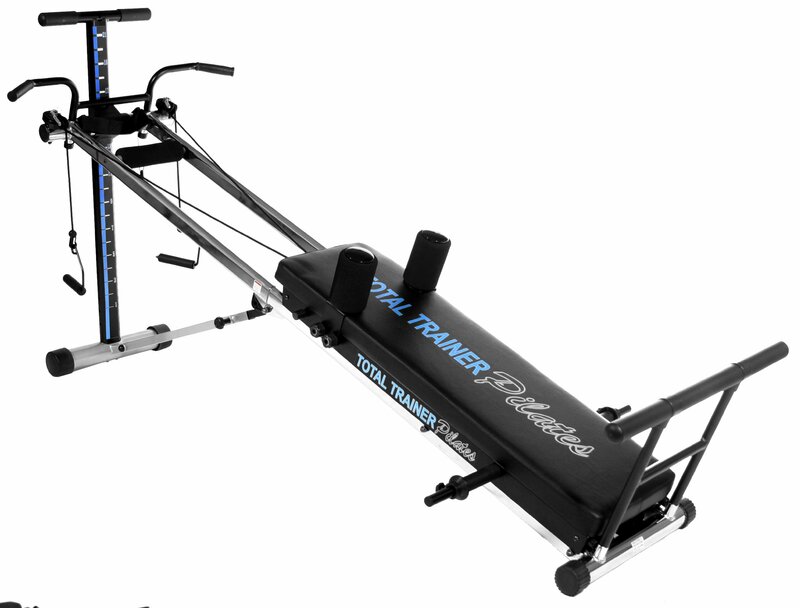 The Bayou Fitness Total Trainer Pilates Pro Reformer Home Gym is a unique reformer that is strong, durable, and capable of strengthening the body through resistance and bodyweight. It allows you to workout without the usage of free weights and other equipment. Now you can workout doing as many unique exercises to help sculpt your entire body. It’s one of our top picks of the best home gym of this year. You can fold it completely in half to fit into a small closet space with ease. When bought, it comes delivered completely assembled, so there is no need to worry about storage and any other struggles involved with having machines that take up too much space. You don’t have to connect anything except to make some small changes for different workouts. Want to focus on your abs? How about your legs and your biceps? There is more than enough exercises and workouts you could do using this machine to sculpt every part of the body. You get multiple straps and additional things to add to the machine for different workouts. You can grab resistance levels of 4% to 69% of your bodyweight. This allows you to truly use your own body to gain more muscle. One of the best ways to increase muscle in the biceps, triceps, and in the back is through pull ups. Just a quick adjustment to the top of the machine and you could do as many pull ups as you choose to. There is a manual inside of a complete video that showcases different Pilates workouts and weight lifting workouts without the weights. Using this machine alone actually allows you to not need any other piece of equipment. The video showcases all the correct movements, exercises, and workouts you can starts doing. Not only do you get the entire Pilates exercises, but you get a ton of other great attachments for other workouts. You get a PRO AB Crunch Strap, power weight bar, sit up straps, squat board, pulley system, slide glide board pulleys, and even bicep curl press bar. You can do countless workouts on this machine to workout every part of the body without using any free weights. Even though it can allow you to do countless workouts, it is great for space saving. It is measured at 20 by 48 by 94 inches when it is completely opened, and it is much smaller when you fold it and tuck it away. When not in use, just hide it in your small little closet and it will fit in right away. It is not big in any way, and it has the capability of handling people of upto 400 pounds. It is definitely expensive compared to other great machines that help others loser weight and get fit. While the equipment is top notch, it may not be that affordable for most people. It is, however, worth the money when buying this because of how it works and its simplicity when setting up for each workout or exercise. There is zero weights to worry about, but for some, this is a downside. Some guys really want to lift the way other bodybuilders do in the gym. This machine is focused primarily for home use and for those who want to stick to their own bodyweight for as long as possible. If you are still on the rise to gaining muscle, start off with this machine and move your way to the gym later down the road. However, you can still do a bunch of weight gaining exercises on it. If you want to look great, lose weight, and get fit, the Pilates Pro Home Gym is worth investing your money into. It can be a good way to workout since you have a video to describe different workouts and exercises. For people who don’t want to get into weight lifting right away, this is a safer version on gaining muscle. This simple machine can be useful to any fitness enthusiast wanting to exercise.